Rice exports are predicted to thrive during the first quarter of 2019 as regular importers are giving positive signs, according to a Ministry of Agriculture and Rural Development source. Rice exports to regular importers such as the Philippines and Indonesia will soar in the first quarter of 2019 as both have recently been hit by natural disasters. The Agro Processing and Market Development Authority made the prediction at a press conference on January 22. The conference briefed expectations of farm produce exports during 2019, reported the news outlet Vietnam Economic Times. 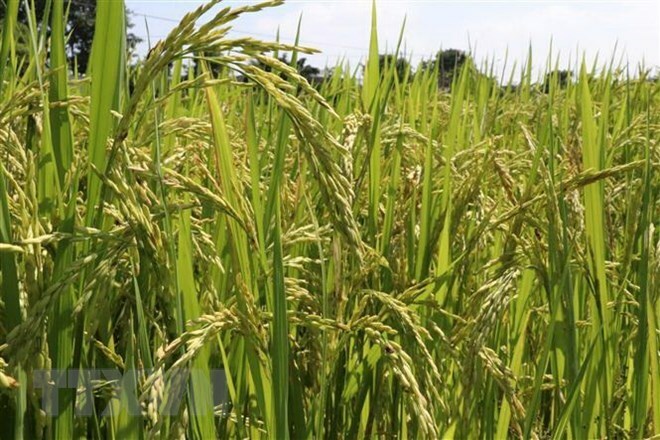 The authority stated rice exports to regular importers such as the Philippines and Indonesia will soar in the first quarter of 2019 as both have recently been hit by natural disasters. As many as 166 Filipino companies have made plans to import 1 million tons of rice, of which many have been ordered from Vietnam. This move came after the Philippines lifted its import restriction policy. Under new rules set by the Philippines, rice imported from ASEAN countries will be taxed at 35% while the rate of rice shipments from non-ASEAN countries is 50%. Upon gaining easier access to the Filipino market, Vietnamese rice will face fierce competition from regional rivals, including Cambodia, Myanmar, and Thailand. Moreover, China, a regular import of Vietnamese rice, has revised its border trading policy and begins to attach more importance to fully-taxed imports. Meanwhile, rice production will be expanded in regional countries such as Cambodia, Myanmar, and Thailand. Apart from rice, high hopes have been placed on the export of other staple products such as peppers, aquatic products, and wooden items. As for fruit products, Nguyen Quoc Toan, acting director of the Agro Processing and Market Development Authority, said that 2018 was a good year for fruit exports with turnover peaking at US$3.8 billion. However, fruit shipments still depend heavily on the Chinese market. In 2019, fruit and vegetable exports have to meet more stringent requirements set by Chinese importers. Regarding aquatic exports, Toan said that the EU-Vietnam Free Trade Agreement is scheduled to come into effect in 2019. This pact enables 90% of the tariffs levied on aquatic products shipped to the bloc to reduce from 14% to 0% over the course of three to four years. This opens up a range of exciting opportunities for the exporters of aquatic products. 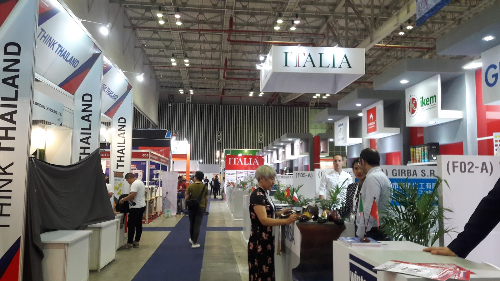 Vietnam’s aquatic exports are forecast to reach US$10 billion in 2019 as the demand for aquatic products from the Republic of Korea and ASEAN countries continues to soar. Vietnamese ride-hailing company FastGo plans to enter the U.S. and Brazil this year as it seeks to quickly expand overseas. Its CEO Nguyen Huu Tuat told VnExpress International that he is keen to compete with other ride-hailing apps in foreign countries. "Our investors are located in the US and Brazil, that’s why we have chosen those places as the next markets," he said without disclosing who they are. The announcement comes a month after it expanded into Myanmar. FastGo now has over 1,000 partner drivers in Yangon and Tuat wants to have 2 million users in Myanmar this year. But the company wants to expand even faster to other markets this year, with Indonesia, where ride-hailing Go-Jek is based, being the first location. "We plan to start operating in Jakarta in March, and will also expand to Singapore this year," Tuat said. The investors want the company to "go global as soon as possible," he said to explain the rapid expansion plans. The company hopes to raise $50 million in the second round by June this year possibly from investors in the Republic of Korea and the US, he said. "Grab and Uber might have deep pockets, but FastGo wants to grab market share by offering better options to customers." FastGo does not collect commissions from drivers but instead charges them an amount of money if they earn a minimum amount per day. FastGo also claims to not increase fees during rush hour but allows users to tip drivers. It became Vietnam’s first home-grown ride-hailing app last June and now has 40,000 drivers in 12 cities and provinces. FastGo last August received $3 million from Vietnamese fund VinaCapital Ventures, according to reports. The Kim Long Motors Hue complex spans approximately 160 hectares, with its first phase costing some 3.33 trillion VND (143.72 million USD). It is designed to annually produce 16,000 buses meeting Euro emission standards. The project is expected to become operational in 24 months. Chairman of the provincial People’s Committee Phan Ngoc Tho said the Kim Long Motors Hue project is in line with the national planning and strategy on auto industry development. The plant will make use of the province’s port and logistics advantages and help attract more investors to the local spare part and mechanical industries, he said, adding that it will create jobs for some 3,000 local workers. The official said he hopes the Kim Long Motors Hue and the Truong Hai – Chu Lai Complex can form an auto manufacturing centre in the central key economic region, which consists of Thua Thien – Hue, Da Nang, Quang Nam, Quang Ngai, and Binh Dinh. On the occasion, Kim Long Nam and Phuong Trang Group donated 20 billion VND (863,950 USD) for the province to upgrade the road leading to King Gia Long’s tomb. 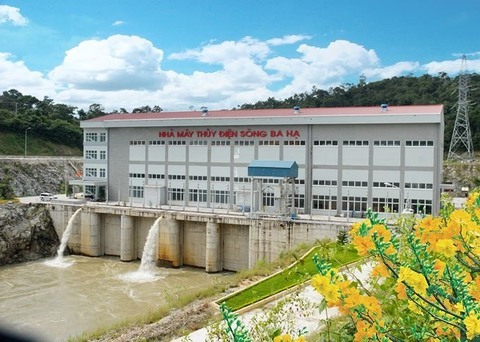 Pham Van Tan, Deputy Director of the Ministry of Agriculture and Rural Development’s Vietnam Institute of Agricultural Engineering and Post-Harvest Technology (VIAEP), said the region each year yields nearly 45 million tonnes of rice, accounting for 54 percent of the whole country’s total. The total straw volume after harvest nears 22 million tonnes, 13 million tonnes of which are disposed of by burning, equivalent to 60 percent. 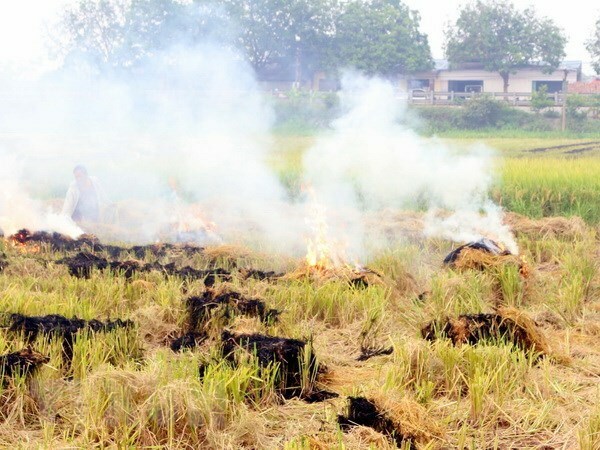 As straw burning pollutes the air, erodes land and wastes workforce, the VIAEP partnered with the Centre for Sustainable Agricultural Mechanisation under the United Nations Economic and Social Commission for Asia and the Pacific to pilot a project on straw management in Vietnam. The project has helped farmers collect straws as cover for plants, feed for cattle, and fertiliser for flowers and vegetables. In particular, the use of straw in indoor straw mushroom cultivation has brought about positive results with high economic value in Binh Thuy and Thoi Lai districts, thus improving farmers’ income. Anshuma Varma from the centre said straw burning in regional countries has affected climate change landscape and worsened post-harvest losses. Therefore, the broader use of straw in handicraft making and mushroom growing has also reduced environment pollution. Accordingly, on offer were seven-year bonds valued at 2 trillion VND (86 million USD), 15-year bonds worth 3 trillion VND (129 million USD) and 30-year bonds worth 500 billion VND (21.5 million USD). A total of 1.3 trillion VND (55.9 million USD) was mobilised from seven-year bonds with an annual interest rate of 4.17 percent, down 0.18 percent from the auction on January 9. Bonds with 15-year maturity raised 4.5 trillion VND (193.6 million USD) with an annual interest rate of 5.12 percent, down 0.02 percent as compared with the January 16 auction. 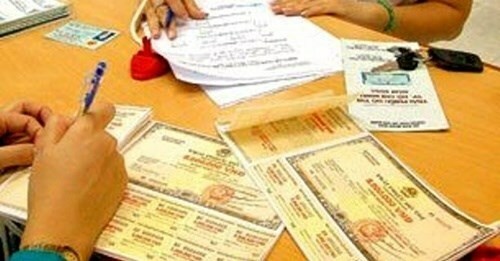 The auction of 30-year bonds sold 395 billion VND (16.9 million USD) worth of bonds with an annual interest rate of 5.8 percent, up 0.38 percent from the auction on July 18. So far this year, the State Treasury has collected over 30.39 trillion VND (1.3 billion USD) from G-bond auctions at the HNX. On January 24, the provincial People’s Committee presented the project investment certificate to the Vietnam Technology & Telecommunication JSC (VNTT) of Becamex IDC and the NTT Vietnam Corporation of NTT East. Earlier, the two parent firms had inked a memorandum of understanding on ICT cooperation in the initial stage of building the Binh Duong smart city. Basing on this deal, NTT Vietnam inked a business cooperation contract with VNTT to provide telecom and ICT services in the province. At the certificate presentation ceremony, affiliates of the Vietnamese and Japanese groups also signed a memorandum on the feasibility study, building and operation of a data centre in Binh Duong. This centre will be a precondition for attracting major financial and e-commerce enterprises to locate their servers in Vietnam, and also for developing local trading activities and services in the future. 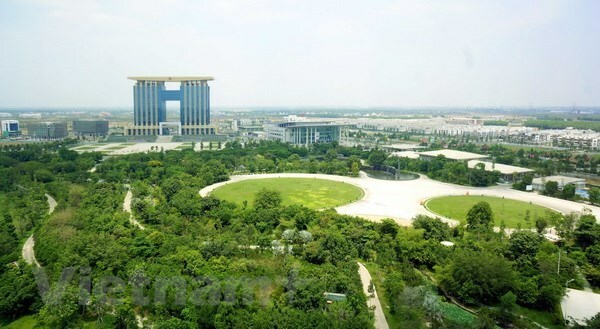 The provincial administration approved the “Binh Duong smart city” plan two years ago with a focus on human resources, technology, businesses and foundation factors. Vice Chairman of the People’s Committee Dang Minh Hung highly valued the partnership between VNTT and NTT Vietnam in realising an important component of the “Binh Duong smart city” plan. He also called on more sectors and businesses to develop this field amid the intensive international integration and Industry 4.0. Nguyen Quoc Toan, acting head of the Ministry of Agriculture and Rural Development’s Department of Farm Produce Processing and Development, speaks at the press conference. Viet Nam will no longer have to ‘rescue’ agricultural products as their prices drop in the coming years, Nguyen Quoc Toan, acting head of the Ministry of Agriculture and Rural Development (MARD)’s Department of Farm Produce Processing and Development said in Ha Noi on Tuesday. 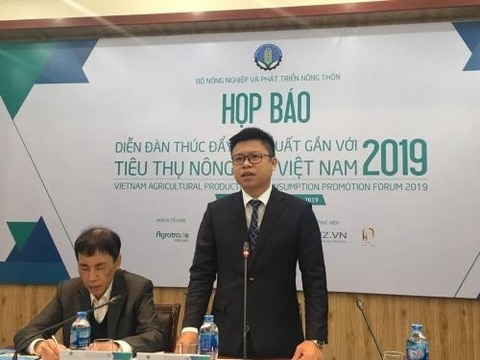 Toan spoke at a press conference introducing the Vietnam Agricultural Product Consumption Promotion Forum 2019, which will be held by MARD in collaboration with the Ministry of Industry and Trade and representatives of cities, provinces, associations and co-operatives in the capital city of Ha Noi on February 22. Toan said Viet Nam must do well in the market, produce clean agricultural products with clear origins and connect production and processing chains. Toan said localities were very important in planning agricultural products. “The forum will review the ‘picture’ of agricultural production and consumption as well as sharing MARD’s view of this issue,” said Toan. The Institute for Brand and Competitiveness Strategy will also provide information on agricultural product branding when Viet Nam’s agricultural products participate in major markets. According to Vo Tri Thanh, Director of the Institute of Strategy and Competition, investing in agriculture is less attractive than other industries, but if the investment is satisfactory, agriculture can be much more attractive. "But more important is creating trust for businesses." The forum will be held annually to create trust for producers, consumers and processors. 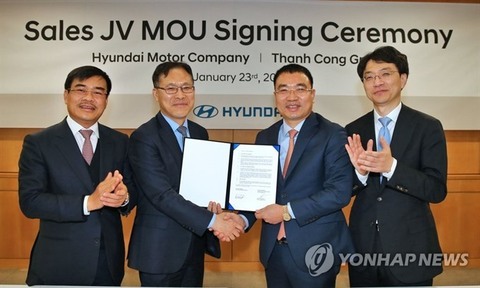 The Republic of Korea’s carmaker Hyundai Motor Company on Thursday said it would set up a joint venture (JV) with Vietnamese firm Thanh Cong Group to boost sales in the emerging market, according to news website Yonhap. On January 23, the two parties signed an initial agreement to establish a sales JV with the goal of selling 100,000 vehicles in Viet Nam by 2020. The joint venture will help boost sales and expand the service network to meet the increasing demand for automobiles in Viet Nam. Hyundai’s vehicle sales in 2018 more than doubled to 55,924 units in the key Southeast Asian market compared with a year earlier. It ranked second in the local automobile market with a share of 19.4 per cent after Toyota Motor Corp, the company said. According to Huyndai statistics, sales of Viet Nam’s automobile sector jumped 27 per cent to 287,949 units last year from 226,120 in the previous year. In order to achieve the sales goal, Hyundai will increase production to 100,000 vehicles in the second half of 2020 from 60,000. The Refrigeration Electrical Engineering Corporation (REE Corporation) plans to raise US$100 million from the private issuance of 2,320 corporate bonds in the first quarter of 2019. The corporate bonds would mature in 10 years with a maximum annual yield rate of 7.3 per cent with interest paid every six months, REE Corporation said on Tuesday. The bond issuance income will fund the firm’s projects and capital transfers. REE Corporation has more than 310 million shares on the Ho Chi Minh Stock Exchange. The company’s shares fell 0.9 per cent to end Wednesday at VND32,400 ($1.39). They gained a total of 3.6 per cent in the previous two sessions. In the first three quarters of 2018, REE Corporation posted a 4.1 per cent yearly increase in revenue, which touched VND3.46 trillion ($149 million). The company recorded post-tax profit in the first nine months of 2018 of VND1.23 trillion, up 18.6 per cent year-on-year. As of September 30 2018, the company’s total assets were valued at VND14.9 trillion. In recent weeks, the Singaporean fund Platinum Victory Pte Ltd has increased its ownership in the Vietnamese firm. As of January 18, Platinum Victory Pte Ltd owned more than 77.1 million shares in REE Corporation, equal to a 24.89 per cent stake. 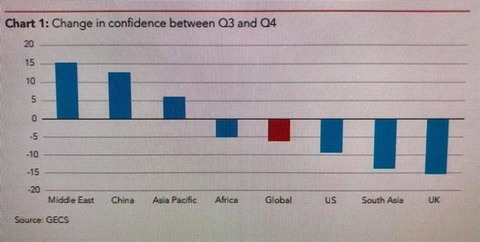 A chart showing the change in confidence between Q3 an Q4 2018. The global poll of 3,800 accountants, jointly conducted by the Association of Chartered Certified Accountants (ACCA) and the Institute of Management Accountants (IMA), shows that all key regions recorded a negative confidence score with signs of growth weakening in the world’s three biggest economies – the US, China and the Eurozone. The GECS Q4 shows that the biggest concern for respondents was again rising costs, with 55 per cent citing this as an issue; 47 per cent of respondents globally are considering laying off staff, with just 18 per cent considering taking on new workers. Thirty nine per cent are considering scaling back investment in new projects, compared with just 16 per cent who are looking to increase investment. The possibility of suppliers going out of business was a concern for just 12 per cent of respondents – unchanged from Q3. Narayanan Vaidyanathan, head of business insights at ACCA, said global economic confidence over the year had been turbulent, with end-of-calendar-year results down compared to the start of 2018. Fieldwork for the Q4 survey took place between November 23 and December 7, 2018 and attracted 3,773 responses from ACCA and IMA members around the world, including 302 CFOs. ACCA is the global body for professional accountants, offering business-relevant, first-choice qualifications to people of application, ability and ambition around the world who seek a rewarding career in accountancy, finance and management. IMA is one of the largest and most respected associations focused exclusively on advancing the management accounting profession. Globally, IMA supports the profession through research, the CMA® (Certified Management Accountant) programme, continuing education, networking and advocacy of the highest ethical business practices. IMA has a global network of more than 100,000 members in 140 countries and 300 professional and student chapters. Its pre-tax profit surpassed the target approved at the annual general meeting early last year. Its return on equity and return on assets were 20.27 percent and 1.58 percent. HDBank’s non-performing loan ratio was tightly controlled at 0.97 percent, the lowest level in the banking industry. In the fourth quarter, the lender achieved a consolidated pre-tax profit of over 1.12 trillion VND (48.3 million USD), up 122.1 percent year-on-year. This included net interest earning of 2.16 trillion VND (93.1 million USD), up 23.9 percent over the same period. With a breakthrough performance in the last quarter of 2018, pre-tax profit for the whole year was worth nearly 4.01 trillion VND (172.6 million USD), the highest-ever and representing an increase by 65.7 percent from 2017. Besides, earnings from services and foreign exchange trading also grew sharply, helping increase the bank’s income by 37.8 percent. Services continued to be a bright spot, with the net profit from services doubling to 438 billion VND. Net earnings from foreign exchange trading also doubled to 298 billion VND. Net interest earnings topped 7.65 trillion VND, an increase of 20 percent from the previous year, though outstanding loans increased by only 18.2 percent. Total income grew by 25.7 percent to 9.44 trillion VND. Assets were worth 216.11 trillion VND, up 14.1 percent from 2017. HDBank mobilised nearly 191.59 trillion VND in deposits and increased its charter capital by 14 percent to 16.8 trillion VND, making it ready to apply Basel Capital Accord II (Basel II) standards when they are adopted by the State Bank of Vietnam. Last year, HDBank achieved its target of opening 45 branches and transaction offices, taking the total number nationwide to 285. The number of consumer financial transaction points increased by more than 2,300 to 13,825, enabling the bank to retain its leading position in the consumer finance industry in terms of network size. Their large networks enable HDBank and HD Saison to efficiently serve nearly seven million customers, especially in rural areas. The bank’s stock – code HDB – which was listed last year, has become one of the 20 largest stocks in terms of market captilisation on the HCM Stock Exchange and sees lots of buying by foreign investors. The bank was awarded the Labour Medal, second class, on the occasion of its 28th anniversary. Moody’s Investors Service has upgraded the baseline credit assessments and counterparty risk assessments for HDBank to B1. HDBank was one of the 37 largest contributors to HCM City’s revenues, and was honoured for it by the municipal People’s Committee. The bank won many awards last year, including for the 40 Most Valuable Brands in Vietnam from Forbes, the “Best Companies to Work for in Asia” award from HR Asia, the “Retail Banking Award” from the Vietnam Banks Association and the International Data Group, and the “Best Cash Management in the Asia-Pacific” award from Euromoney. HDBank also attaches great importance to community programmes. It gave scholarships to 1,000 students, donated health insurance cards to thousands of near-poor people and funded cataract surgeries for thousands of poor patients. The bank is also a stakeholder in the development of the country’s sports. Last year, for the eighth time it organised the HDBank Cup International Chess Tournament, which resonated in the world of chess. Last year was the largest event with 271 players taking part, including 125 from 21 countries and territories. The second HDBank Futsal Prize (National Championship and Cup) held last year with attractive games and top-quality competition contributed to the growth of Vietnam’s futsal in the international arena. This year, HDBank hopes to increase its assets to 328.59 trillion VND, mobilise more than 303 trillion VND in deposits and generate pre-tax profits of 5.1 trillion VND, have total outstanding loans of 210.84 trillion VND if it falls within the credit growth limit approved by the SBV, and increase the number of transaction points to 308. Vietnam’s rice exporters could be set for a big first quarter, with demand from the Philippines and Indonesia being forecast to increase due to the impact of recent natural disasters. The Agro Processing and Market Development Department under the Ministry of Agriculture and Rural Development said in a recent press briefing it predicted a mixed year for the country’s key farm products. Rice in particular looks set for an export bump thanks to the Philippines removing import restrictions, leading to 166 Filipino firms applying to purchase 1 million tonnes of rice. Many of these firms intend to buy the grain from Vietnam. Under a new rice policy, the Philippines will impose a tariff of 35 percent on rice from ASEAN countries while the rate from non-ASEAN exporters, 50 percent. However, Vietnam will also face fierce competition from regional rivals like Cambodia, Myanmar and Thailand. Additionally, China – a major market of Vietnamese rice – has changed its cross-border trade management and boosted investment in rice production in regional countries like Cambodia, Myanmar and Thailand. That is likely to pressure rice shipments, the department said. Regarding fruit exports, Acting Director of the department Nguyen Quoc Toan said overseas shipments of fruits hit a record of 3.8 billion USD in 2018. As fruit exports benefited from many favourable conditions last year, cultivators have sharply increased the output of many fruits like lychee, longan, orange, mango and rambutan. However, he admitted fruit exports are still too reliant on the Chinese market, adding China has tightened import management in recent months. In 2019, fruit, vegetables and food will have to satisfy stricter requirements to be imported into China, Toan noted. Pepper prices are forecast to rebound slightly this year as the output in some big exporting countries, including Vietnam, Brazil, Indonesia and India, is likely to decline from 2018. Vietnam is expected to produce 175,000 tonnes of black pepper and 25,000 tonnes of white pepper in 2019. Meanwhile, rubber exports rose 13.3 percent in volume but down 7 percent in value last year. Rubber prices have tended to increase slightly in line with the developments in the global market since last December, but they are unlikely to hike strongly in 2019 due to a lack of support factors and weaker Chinese demand, the Agro Processing and Market Development Department said. Difficulties are also predicted for Vietnam’s tea exports, which fell 8.6 percent in volume and 4.1 percent in value year on year in 2018, it noted, pointing to the oversupply in the global market, almost stagnant tea demand and strict requirements in importing countries. In terms of aquatic exports, Toan said the EU-Vietnam Free Trade Agreement will take effect this year with tariffs on about 90 percent of Vietnamese aquatic products destined for the EU reducing to zero percent in three or four years. This is a considerable advantage for aquatic products from Vietnam as the EU’s tariffs on similar products of other countries stand at about 14 percent. Besides that, demand in some markets like the Republic of Korea or ASEAN countries is forecast to soar in 2019. Therefore, Vietnam is likely to record a surge in aquatic exports this year to reach 10 billion USD, the official added. Demand for luxury condos remains high in HCM City, especially in the central areas in spite of high prices, experts have said. One of them said there are claims that the city real estate market is witnessing a surplus in the high-end condo segment, but the reality is that there is a huge number of investors pouring money to buy them. He added that this shows the demand is real and the property developers who would succeed are ones who keep their commitment. In a speech she made at a conference on the real estate market in HCM City, Duong Thuy Dung, senior director of CBRE Vietnam, concurring with this assessment, saying that in the case of some high-end condo projects the number of customers wanting to buy is four times the number that the developers are offering for sale. These are projects situated in the heart of the city, where the scarcity of land has spurred the construction of tall buildings, she said. One of the projects being developed in the heart of HCM City, in District 1, is The Grand Manhattan by Novaland Group. By launching the project at the end of last year, Novaland brought a new dynamism to the city’s property market. Overlooking two roads, Co Giang and Co Bac, the project spreads over an area of 14,000sq.m. It will have many amenities meeting the international standards of a five-star resort like park, shopping centre, swimming pool, BBQ area. Buyers of a condo in the project will also get their own parking slot. Ownership of a parking slot is a special offer the developer wants to make to residents because finding a safe parking place in the centre of HCM City is not very easy. The residents… Who are they? Since the prices are so high, many wonder who will buy and come to live in projects like The Grand Manhattan. Soon after its launch in the market, the project has attracted many Vietnamese and foreigners working and living in the country or invest in booming HCM City. Elena Goh, a property investor from Singapore, was one of the first people to buy a unit in The Grand Manhattan. “We decided to buy within a second,” she revealed. She said in Hong Kong and Singapore, high-end condos in central areas always bring high profits, and since HCM City is a growing market the profit will be higher. Furthermore, she has already invested in some of Novaland’s projects and feels secure. Ly Quoc Hung is an overseas Vietnamese from the Netherlands. He said he has invested in many Novaland projects and loves the brand. The Grand Manhattan attracts not only people from outside the country but is also an ideal choice for people living in the city. Furthermore, he said, the profit can be 25-30 per cent. The Grand Manhattan will absolutely meet the demand of people with high income within and outside the country. The high-end condo segment is always attractive and sustains its value over time. High-end condo projects in central areas not only meet demand from buyers but also create a new appearance for the city. Lam Tran, 34, is a French overseas Vietnamese with over 10 years’ experience in marketing at Google Europe. He returned to Vietnam and founded Wisepass, a lifestyle app that connects users to a wide range of dining, leisure and entertainment services through paid membership packages. In 2018, Lam made WisePass available in Thailand and the Phillipines. "I believe to succeed businesses must lead their home market first, before thinking of expanding overseas," said Lam. Having set up the business in HCM City and then expanded to Hanoi, Lam regularly flew to the capital city to attend events and promote his products. After selling 10 memberships in a day, Lam was able to show employees the direction and potential of WisePass. "Global expansion may sound intimidating, but after all, founders must start from the smallest things: talk to customers, selling products," Lam said. There is no need to wait for big events, he added, "all you need to do is show up and market your product at appropriate places." In 2016, he launched Base.vn, a business management software under the Software-as-a-Service (SaaS) model, where software is leased under a subscription instead of installed. The app is built to unify corporate governance processes, from administration to human resources, task management, financial management to sales marketing. "After Indonesia, Singapore and Malaysia, we believe that Vietnam can become the next major technology powerhouse in the region," Chandra Tjan, co-founder and partner of Indonesian fund Alpha JWC Venture said. In addition to Base.vn and WisePass, in the past few years, the Vietnamese startup community has received many other innovations: WeFit (fitness), Elsa (language learning), Logivan (van hiring), GotIt (gift delivery), and Uiza (video streaming). Most of these entrepreneurial efforts have been successful at carving their own niche in the Vietnamese startup ecosystem.